This guide is for transfer students from other institutions who have second-year standing in Science. It walks you through course selection from the point of choosing your specialization to the first day of class. The requirements of a specialization determine the courses you need to focus on during registration. 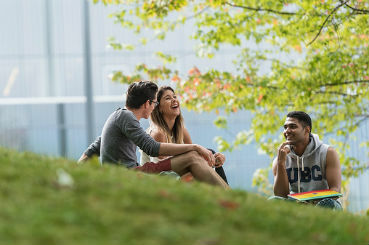 Now is the time to explore UBC Science's program specializations -- get a feel for requirements, explore UBC calendar entries, bookmark contacts for departmental program advisors, and discover student clubs for each program specialization. UBC Science runs a coordinated application for program specializations in June. You'll be asked to designate your three top choices of specialization. Preview the application process here. Some transfer students are eligible for Year 3 standing based on how their transfer credits apply to a specific specialization. Check out the Supplementary Information Form. Once you submit the form, Science Advising and the relevant department determine if you meet the requirements for Year 3. For some high-demand specializations (Biology, Computer Science, and Microbiology and Immunology) you’ll need to complete the specialization’s own application in May or June. Learn more about the specific application processes on department websites. For many specializations you’ll receive an email from Science Advising with the outcome of your request. For high-demand specializations you’ll hear directly from the department. It’s important to start with your high school classes, which may be pre-requisites for some UBC courses. UBC Science may not apply high school courses in the same way that your previous institution did - this can have an impact on which university courses you’re eligible to take. Note any courses that you may still need—in subsequent steps, you can determine if you have the pre-requisites you need through post-secondary course transfer credit, or whether you’ll need to complete the pre-requisite at UBC. High School: Do You Have? At least one year of biology during your senior secondary program. Take BIOL 111 Take ONE of ASTR 101, ASTR 102, BIOL 112, BIOL 121, EOSC 110, EOSC 112, EOSC 114, ATSC 113, GEOB 102 or GEOB 103. Are you exempt from the LPI? If you're uncertain, check here. If you're NOT exempt, did you achieve a level 5 on the LPI? Take Writing 098. Check LPI deadlines, which are also found on the First Year English website. Take SCIE 113 and ONE of ENGL 110, 111, 112, 120** and 121** or take TWO of those ENGL courses. SCIE 113 is available only to first years. You have until the end of Year 3 to complete the Communication Requirement. * A two-term course. For information on the Mathematics Basic Skills Test, which may permit a student to take MATH 100, 102, 104, 180, or 184 instead of MATH 110, visit the UBC Math site. ** Honours courses intended for students specializing in the area. Start by reviewing the transfer credit section of the UBC Academic Calendar. Once you’ve reviewed the Calendar, read on. In most cases, transfer credit articulation will be complete by mid-June. If by mid-June you don’t see information about your transfer credits on the Student Service Centre, please contact Science Advising. For international students, the process can take longer – please be patient and see our tips for how to register while you wait for more information. Depending on the institution you’re arriving from, UBC may need to do more work to articulate (evaluate and determine) your unassigned transfer credit. For instance, students transferring from institutions within British Columbia or other major institutions in Canada will not need to have their unassigned credits further articulated. However, students transferring from institutions overseas may have a number of unassigned credits which need to be further articulated upon arrival. Check your transfer credits under Grades and Records in the Student Service Centre. Note which credits are assigned (e.g., PHYS 101) and which are unassigned (e.g., PHYS 1st). If most of your credits are unassigned by UBC Admissions, you likely need to get those credits further articulated by the respective Science department in order to determine if you have already completed some pre-requisites for UBC courses. For instance, if you obtain an unassigned credit in Chemistry (CHEM 2nd) for an Organic Chemistry course you took, you would need to contact the Chemistry Department and have them review your course syllabus and course description to assign a specific equivalence here at UBC. Contact the appropriate department (look for “program advisors” link under the correct specialization) for each unassigned credit. Gather the course descriptions and syllabi of the courses you have taken at your previous institution(s). You can’t proceed without these. For each course that you’ve received unassigned credit for, contact the relevant UBC department to request that they review your documentation to determine if they can assign a specific UBC course equivalence (be sure to include your UBC student number). It can take a number of weeks for this process. Confirm expected timelines with the department when you submit your documentation. When your registration day and time arrive, you may not have answers about all your transfer credits. In each of these cases, treat the credit as unassigned and register for all the courses that you don’t have specific credit for at UBC. You can drop the required course at a later date if you receive transfer credit for it. Courses must overlap significantly with UBC curriculum in order to be assigned a specific course for transfer credit. So you may still have unassigned credits after review--that the credit will count toward your degree generally but will not count toward specific course requirements in your program. When your coursework at another institution overlaps significantly with a course at UBC, you might receive course-specific credit (e.g., CHEM 233). Courses that don’t sufficiently overlap will be ‘unassigned’ or generic year-level credits. They can count towards requirements such as ‘18 credits of lower-level coursework’ and occasionally as prerequisites for higher-level courses. Check with the relevant department to confirm if this is the case for your course. Generic year-level credits don’t generally satisfy specific requirements (e.g., CHEM 233) towards completing your degree. And if you have CHEM 2nd transfer credit for a chemistry course that covered some organic chemistry but not everything in the curriculum of the required course at UBC, you’ll need to take a second year UBC organic chemistry class to fulfill your degree requirement. After you are notified about the outcome of your specialization application and you review your transfer credit, you’re now ready to choose your courses. Return to the UBC Calendar for a reminder of the year-to-year course requirements for your specialization. The Calendar entry for your specialization also provides a sample year-to-year timetable. For instance, for a Major in Biology you would look up the Biology Calendar Entry in the UBC Calendar. In Step 2, you identified courses that you may still need to take. Use this as your starting point. In June, you’ll be notified of your registration date and time via email. Courses fill up quickly, so be prepared with more than one worklist ahead of your registration day. You’ll also need to be prepared to register for term 1 AND 2. Learn how to use the course registration system. Some specializations have a Standard Timetable (STT) option, requiring you to register for a block of your core courses with one click. When you see a course section marked STT, you will only be able to register in that section if you are in the specific specialization that is noted. There are many things to be prepared for and aware of when you’re registering. We’ve compiled a list of the major registration questions and answers for UBC Science students. The FAQs include information about restricted seats, how to switch course sections without losing your seat, and more. Don't Panic If You Can't Get Into a Course! Many classes may be full during your registration time. Don’t panic! If there's another section with seats, register immediately. If all the course sections are filled, register for the waitlist. Remember, a waitlist requires that you wait! Science Advising, your department, and course instructors can’t move you into a class. If you’re on a waitlist you’ll be placed in the class in order as other students switch sections. Check out tips and more. Choose an appropriate courseload for your first year at UBC Science. A full courseload is 30 credits or more over the two terms of the winter session. Plan your timetable well, and leave some time for fun. Sports, recreation, and social time will give you balance. You may need a certain number of credits per term to be eligible for housing, student loans, UBC scholarships, and an honours program. Questions about course planning, registration or degree planning. Review the program specialization entry for an overview of your degree. Connect with your program advisor for help with specialization requirements. Can help with questions on coursework, research opportunities, or further study options. ESAs can help advise on financial support, student loan applications, and technical issues with the SSC.